Heat oven to 325°F. Place beef, fat side up, on rack in shallow roasting pan. Rub garlic halves over beef. Spread 1/4 cup mustard over top and sides of beef. Mix remaining Rib Roast ingredients except oil; stir in oil. Spread herb mixture over top and sides of beef. Insert meat thermometer so tip is in center of thickest part of beef and does not touch bone. Roast uncovered 1 1/2 to 2 hours for medium doneness (155°F). Meanwhile, mix all Peppery Horseradish sauce ingredients. Cover and refrigerate at least 1 hour to blend flavors. Cover beef loosely with foil tent and let stand about 15 minutes before carving. (Temperature will rise about 5°.) Serve with Peppery Horseradish Sauce. Use regular Dijon mustard for the country-style. Letting the roast stand 15 minutes makes it easier to carve because the juices will set up. 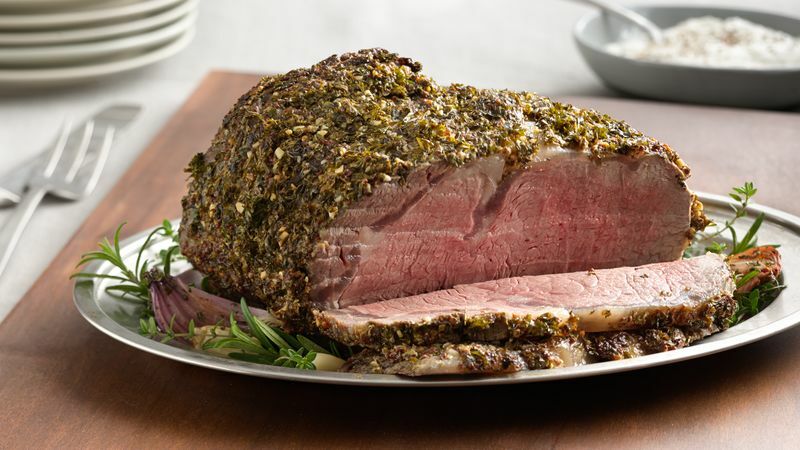 Avoid covering the roast too tightly while it stands, which will create steam and soften the surface of the beef.